Home » The Law & You » I Ran Into a Tractor-Trailer at Night. What Can I Do? I Ran Into a Tractor-Trailer at Night. What Can I Do? While driving at night, a viewer ran into the back of a tractor-trailer. He didn’t see the truck until it was too late. Is there anything he can do? Tractor-trailer accident lawyers Ed Ciarimboli and Corey Suda explain what his next steps should be. 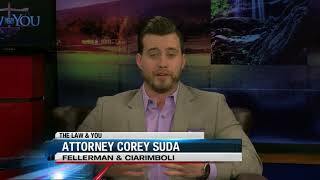 Dave Kuharchik: We’re talking about a tractor-trailer crash in this edition of “The Law & You.” Back with us tonight, attorneys Corey Suda, who’s here for Greg, and Ed Ciarimboli. Thanks for being here, guys. April 23, 2019Who’s to Blame for Your Motorcycle Crash?